Rare Earth Elements (REEs: Sc, Y, La–Lu) are found in numerous future-oriented applications such as in magnets for green technologies and in fluorescing materials. A shortage of resources is already forecast for diverse REEs, which suggests it may be necessary to recycle these elements and optimize technologies. Both aspects will be addressed in this paper. Model experiments with regards to damage monitoring using [Eu(DBM)4TEA] and the recycling of neodymium(III) sulfate in hard disk magnets will also be presented. These are experiments for teachers and students who already have advanced experimental experience, such as trainees at vocational schools. Future-oriented applications for Rare Earth Elements (REEs) include powerful NdFeB magnets in wind power plants, electric motors and IT technologies 1, 2. As good growth is forecast for these sectors, effort is being invested in the further development of magnetic material recycling. REEs are also found in fluorescing materials for fluorescent tubes and LEDs 3, 4. Good growth is also forecast in this area as the demand for (large format) screens is increasing in the home entertainment and workplace sectors. The production of touch screens also requires the use of polishing materials containing REEs. REEs are also highly relevant in technical chemistry as catalysts and as constituents in ceramics. Luminescent REEs have recently been tested for the monitoring of technological processes 5, 6, 7, 8, 9, while further attention is also being paid to bioinorganic processes 10, dissipation 11 and REE recycling 12, 13. Over the long term, the supply situation for various raw materials such as dysprosium (Dy), terbium (Tb), europium (Eu), neodymium (Nd) and yttrium (Y) will become critical for the economy. The study “Minerals, Critical Minerals, and the U.S. Economy” 14 introduced the current degree of criticality – supply risk and importance to technology. The matrix in Figure 1 indicates the forecasts for REEs. The expression “critical” does not refer to the availability of REEs in the earth’s crust, but characterizes a multifactorial problem. This includes the concentration of REE mining within just a few countries, economic stability, supplier trade policies, and recovery rates. China provides a good example: The People’s Republic supplies over 90 percent of global REE demand and is, at the same time, the biggest REE consumer 15. All raw materials where supply bottlenecks are forecast are subject to government control in China. The country is creating advantages for itself compared to other countries; on the one hand through the expertise of their own REE industry and, on the other hand, through price dumping due to lower costs for personnel and environmental protection. China is also using its raw materials strength to persuade foreign companies to build their production facilities in China with the lure of secure access to REEs. Numerous countries have since reacted to this resource policy with their own research into efficiency optimization of technologies and the substitution of REEs. “Robust decision making” 16 is being promoted in this respect. This refers to decisions that can be adapted when unforeseen problems occur. 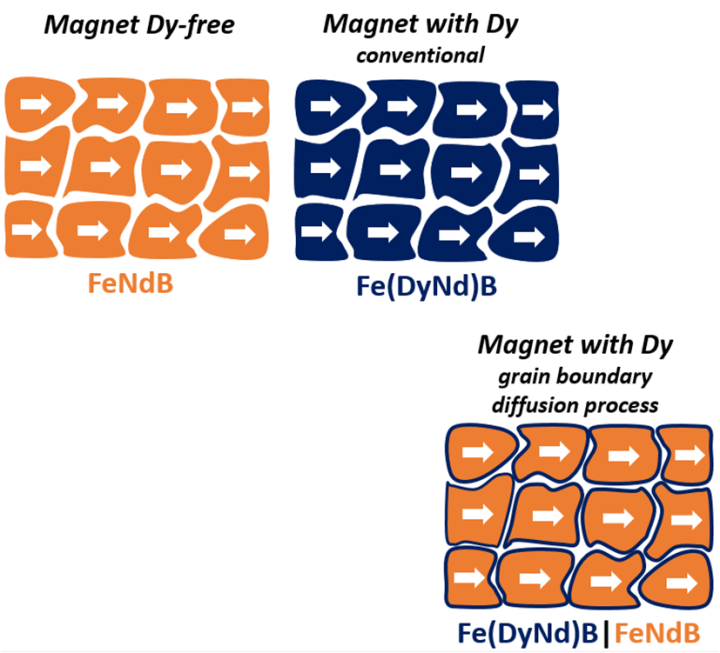 An impressive example of the sustainable handling of REEs is the “grain boundary diffusion process” concept 17, 18 used to decrease the proportion of dysprosium in NdFeB magnets. These magnets are mixed with dysprosium so that they are heat resistant, for instance, for use in wind power plants. Until now, dysprosium has been homogeneously melted into the magnetic material during magnet production. However, a homogeneous dysprosium distribution is not actually necessary. It suffices when the NdFeB grains making up the magnets are coated in a layer of dysprosium just a few nanometers thin. This is achieved through a process where the dysprosium is diffused into the magnet, which results in powerful NdFeB magnets with a lower percentage of dysprosium (Figure 2). Students can practice key skills in chemistry lessons using REEs as a topic, particularly the scientifically-based evaluation of facts 19. 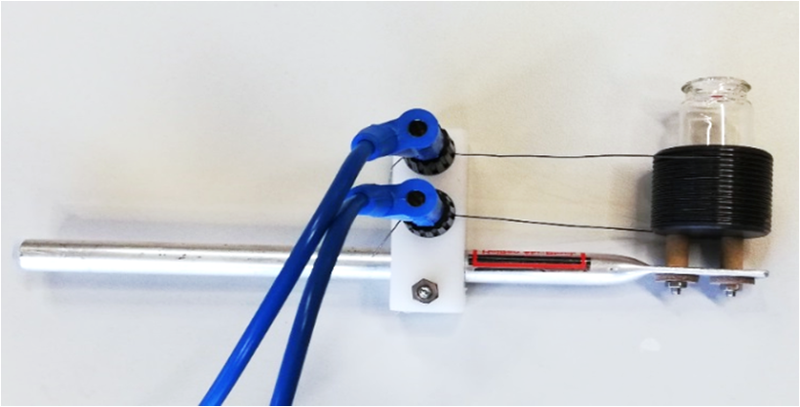 In this paper, the damage monitoring model experiment presents a special example where students can develop technology visions with REEs. This promotes reflection on the value of creativity in research 20. Using the example of recycling, they can learn that sustainable REE handling involves the complete product chain, starting from raw material extraction, production and product use right up to waste disposal. Because recycling starts well before product disposal. 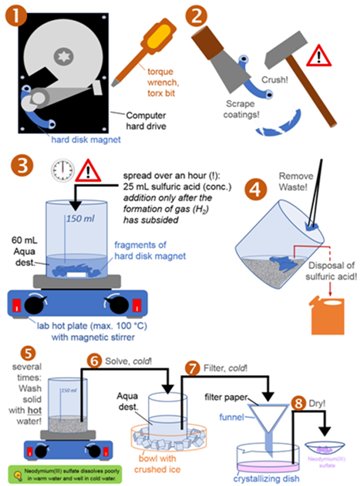 In the case of NdFeB magnets and fluorescing materials, waste is already produced during their production 12. This means that intermediate steps in production processes can also be optimized by recycling. Lessons can also be used to compare various recycling approaches – with regards to NdFeB magnets or processes in pyro, hydro and bio-metallurgy where materials are exposed to high temperatures, acids/alkalis or bacteria, or decrepitating using hydrogen 21. Students thereby learn to evaluate the potentials and limits of technologies. Overall, efficiency optimization of technologies and REE recycling address important aspects of scientific literacy, particularly the role of science-based technology and the role of science in society and personal life 22, 23. Since the mid-1980s, ESA (The European Space Agency) has been active in technology and operational aspects related to space debris 24. Even the smallest of particles can cause significant damage to satellites and spacecraft. But how is it actually possible to ascertain whether and where a particle has struck? One solution strategy is offered by substances that emit light when mechanically stressed 6, 7, 8, 9, such as triethylammonium (tetrakisdibenzoylmethide) europium(III) [Eu(DBM)4TEA]. The emission triggered by a particle impact can be registered by sensors. We will use the heater from the micro kit as per Baumbach 25 (Figure 3) to synthesize [Eu(DBM)4TEA] as the micro-scale offers the advantages of resource-efficient substance handling and reduced risk potential. A glass snap-cap vial, where synthesis will take place, fits in the middle of the heating coil. 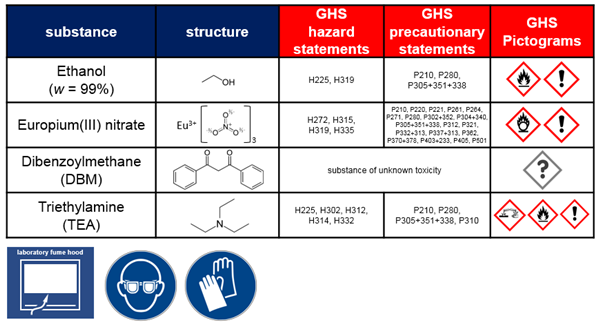 The experiment must take place under a fume hood as the chemicals are harmful. Safety glasses and gloves must be worn! Eyes and hands must not be exposed to UV light when the UV lamp is in use. 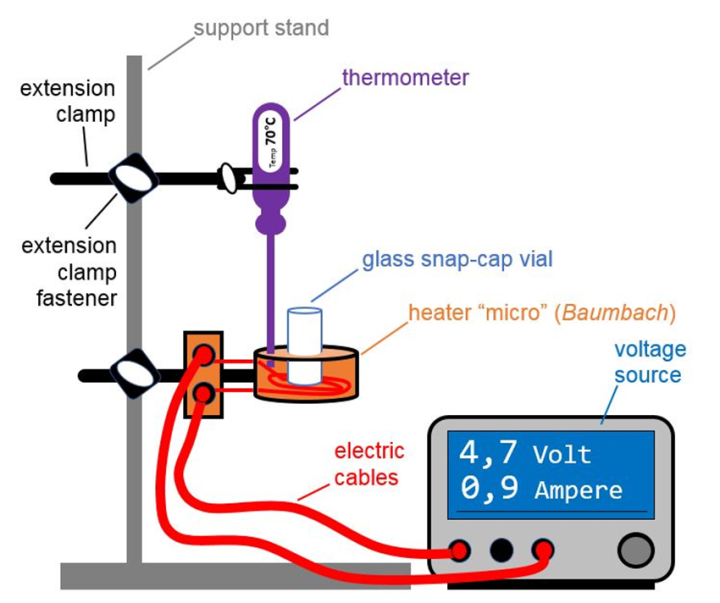 Heater “micro” (Baumbach), voltage source, electric cable (2 x), support stand, extension clamp fastener (2 x), extension clamp, thermometer, glass snap-cap vial (max. 16 mm diameter), watch glass, petri dish (2 x), crucible tong, suction filtration unit (suction flask, Büchner funnel, filter paper, rubber tube, rubber bung, vacuum pump), UV lamp, laboratory weight, pipettes (dropper), spatula; chemicals are listed in Table 1. Place 0.75 mL ethanol in the glass snap-cap vial. Add 0.05 g europium(III) nitrate and 0.1 g DBM. 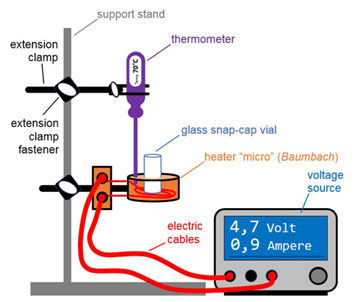 Connect the heater to the voltage source and place the glass snap-cap vial in the heating coil. Switch the unit on (4.7 V at 0.9 amperes). Heat the glass snap-cap vial to approximately 70 °C. Check the temperature with a thermometer. The europium(III) nitrate and the DBM must dissolve fully in the ethanol. If this process needs to be faster, occasionally remove the glass snap-cap vial from the heating coil with a crucible tong and swirl gently. As soon as a clear (yellow) solution is present, add 0.15 mL TEA to the glass snap-cap vial. Switch the voltage source off. Carefully remove the glass snap-cap vial from the apparatus and leave to cool in a stand. Subsequently place the contents on the filter paper in the Büchner funnel (Figure 5). 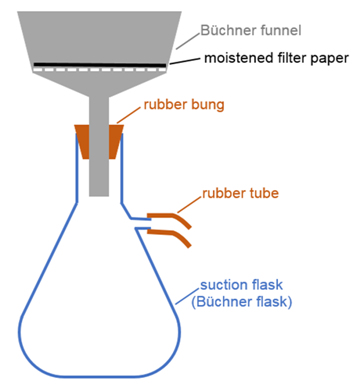 Filter under vacuum. Wash the remaining crystals with very little ethanol. Continue drying under vacuum for approximately five minutes as the crystals must be completely dry. Place the dry crystals on a watch glass. 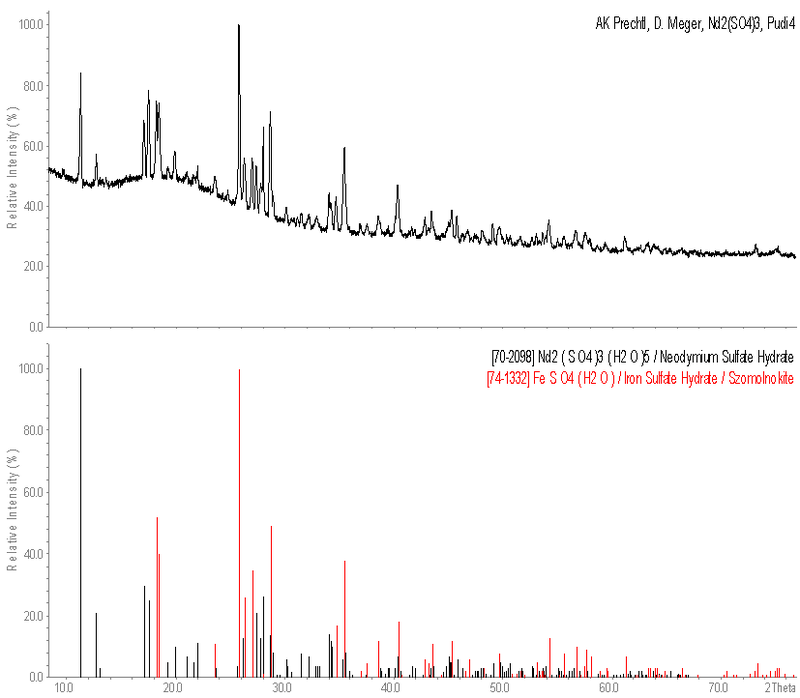 The phenomena luminescence and triboluminescence can be demonstrated using [Eu(DBM)4TEA]. 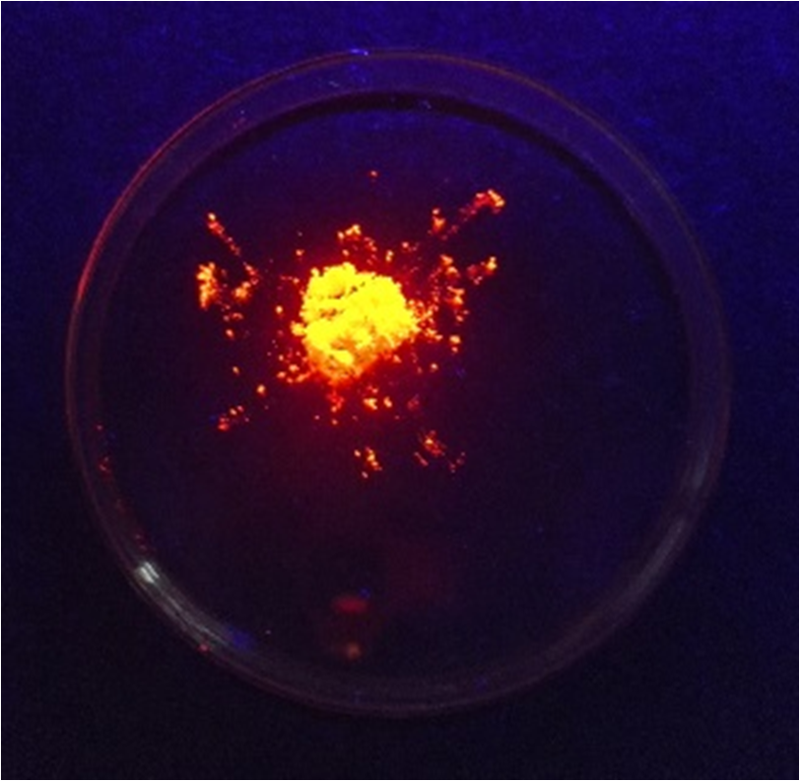 To demonstrate luminescence, place a few crystals on the back of a petri dish and illuminate them with a UV lamp (Figure 6). To demonstrate triboluminescence, lay the back of a second petri dish on the first petri dish so that the crystals are trapped between both petri dishes. The room needs to be darkened for this part of the experiment. (The UV lamp must be switched off.) Press the two petri dishes together and twist in opposing directions (Figure 7). Triboluminescence occurs when the crystals are crushed. 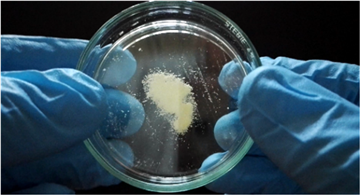 When the experiment is finished, the crushed crystals can be redissolved in ethanol, recrystallized, dried and used again. TEA, DBM and Eu3+ form the coordination complex [Eu(DBM)4TEA] 26 with square antiprismatic geometry of eight coordinated europium (Figure 8). The organic ligands absorb energy from UV light. An excited state is reached. The excited electron moves to the triplet state through an emission-free transition. The energy is transferred from the ligands to Eu3+ through another emission-free transition. Orange-red light is emitted during relaxation (see also Jablonski diagram and Franck-Condon principle). The deformation of the crystal symmetry is responsible for the triboluminescence that occurs when the crystals are subject to friction. This leads to stimulation of the ligands, followed by energy transfer to Eu3+ and, finally, to the emission of light 7. An apparatus as shown in Figure 9 must be set up for the damage monitoring model. The black paper under the Plexiglas is used to shade the lower area against light and must have two small cut-outs: one where both slides are positioned and one where the mobile phone is switched on at a later point. 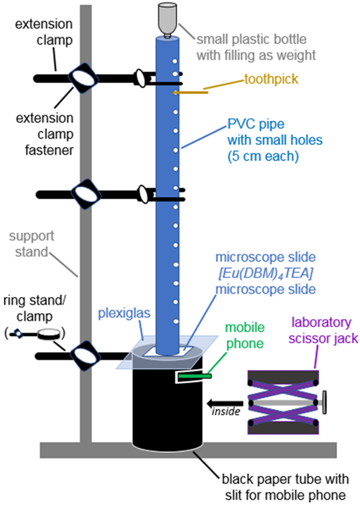 The mobile phone is positioned under the Plexiglas with the aid of the laboratory scissor jack. The pipe will be placed on top at a later point. Place two spatula tips full of crystals in the middle of one slide. Place a second slide on top. Place the prepared slides on the Plexiglas over the cut-out in the black paper. Position the weight, i.e. the plastic bottle, in the pipe and hold in place at the height desired using a toothpick inserted through a hole drilled in the tube. Place the loaded drop pipe on the slides and stabilize with the support stand. Start recording on the mobile phone and let the weight in the pipe drop by pulling the toothpick out of the hole in the pipe. The weight will then fall onto the slides with the crystals. Repeat the experiment at different drop heights (5 cm, 10 cm, 15 cm ... 40 cm). Use the potential energy that the weight has (m = 0.005 kg) to calculate the energy required to stimulate the triboluminescence of [Eu(DBM)4TEA]. The energy is calculated from the mass of the weight m (in kg), the gravitational acceleration g (9.81 m/s2) and the drop height h (in m): E = m • g • h (energy unit: Joule). – The crystals between the slides should be replaced after four runs. 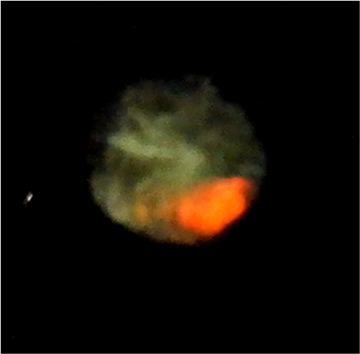 The experiment demonstrates the possibility of monitoring the impact of a body using triboluminescence, which can be documented using a mobile phone (Figure 10). During our experiment, the crystals began to emit light as of 25 cm drop height of the weight (m = 0.005 kg) (energy per surface area: 0.0039 J/cm2). Computer hard drives (2 x), torque wrench, torx bits, glass beaker (high form, 150 mL), glass stirring rod, funnel, filter paper, crystallizing dish, lab hot plate with magnetic stirrer, distilled water, bowl with crushed ice; chemicals are listed in Table 2. The magnets from two computer hard drives with 10 to 16 grams magnet material each will be used for recycling neodymium(III) sulfate from NdFeB magnets. The minimum quantity to achieve good experimental results is 20 grams. The experiment must take place under a fume hood. Safety glasses and gloves must be worn! Note that the magnets contain boron. Boric acid, which is toxic to reproduction, is formed at over 200 °C. This temperature should not actually be reached during the experiment. However, it is important to ensure that the temperature is not set too high accidentally. Additionally, some magnet types have a thin nickel coating. The reaction with sulfuric acid can result in nickel compounds that are carcinogenic and can cause allergies. The magnet coating should therefore be scraped off with a sharp object as a precaution. As an option, a test can be carried out for nickel(II) ions (Ni-DADO) during the reaction. The reaction with sulfuric acid produces hydrogen gas (H220: Extremely flammable gas; P210: Keep away from heat, hot surfaces, sparks, open flames or other sources of ignition). The experimental procedure is shown in Figure 11. Note: neodymium(III) sulfate is one of the very few substances that dissolves less easily in heat than in the cold. This is why dissolving and filtration is done cold at the end of the experiment. Recycling NdFeB magnets with sulfuric acid yields the pale violet neodymium(III) sulfate. The idealized reaction equation (Figure 12) shows that hydrogen is released. Iron and sulfuric acid also react with each other, forming iron(II) sulfate and hydrogen. 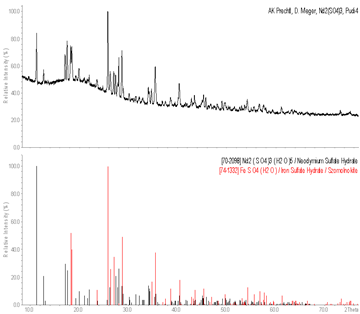 Analysis of the product using powder diffraction confirmed that neodymium(III) sulfate was recycled (Figure 13). As this measuring method is not available in schools, UV/VIS spectroscopy can be carried out as an alternative 28. The International Year of the Periodic Table of Chemical Elements 29 offers a current motivation to present REEs in chemistry tuition. It is time to pay more attention to REEs in chemistry tuition in consideration of their numerous application options and cultural-economic significance. Our thanks go to David Mieger for testing the model experiment for the recycling of neodymium(III) sulfate, the teacher trainees at TU Darmstadt for testing the experiment on damage monitoring and Prof. Dr. Barbara Albert for her ever helpful tips. Eliseeva, S.V. and Bünzli, J. -C.G, Rare Earth: Jewels for Functional Material of the Future, New Journal of Chemistry, 35(6). 1165-1176. 2011. Gutfleisch, O., Willard, M.A., Brück, E., Chen, C.H., Sankar, S.G. and Liu, J.P., Magnetic Materials and Devices for the 21st Century: Stronger, Lighter, and More Energy Efficient, Advanced Materials, 23(7). 821-842. 2011. Höppe, H.A., Recent Developments in the Field of Inorganic Phosphors, Angewandte Chemie (International Edition), 48(20). 3572-3582. 2009. Terraschke, H. and Wickleder, C., UV, Blue, Green, Yellow, Red, and Small: Newest Developments on Eu2+-Doped Nanpophosphors, Chemical Reviews, 115(20). 11352-11378. 2015. Bischoff, L., Stephan, M., Birkel, C.S., Litterscheid, C.F., Dreizler, A. and Albert, B., Multiscale and luminescent, hollow microspheres for gas phase thermometry, Scientific Reports, 8(602). 1-9. 2018. Hollerman, W.A., Fontenot, R.S., Bhat, K.N., Aggarwal, M.D., Guidry, C.J. and Nguyen, K.M., Review of Triboluminescence Impact Research at Projectile Speeds of 1 m/s to 6 km/s, Procedia Engineering, 58. 392-400. 2013. Teotonio, E.E.S., Faustino, W.M., Brito, M.F., Felinto, M.C.F.C., Moura, J.L., Costa, I.F., Santos, P.R.S., Mechanoluminescence of Coordination Compounds, in D.O. Olawale, O.O.I. Okoli, R.S. Fontenot, W.A. Hollerman (Eds. ), Triboluminescence: Theory, synthesis, and application, Springer, 39-63. 2016. Sage, I. and Bourhill, G., Triboluminescent materials for structural damage monitoring, Journal of Material Chemistry, 11(2). 231-245. 2001. Olawale, D.O., Okoli, O.O.I., Fontenot, R.S. and Hollerman, W.A., Triboluminescence: Theory, synthesis, and application, Springer. 2016. Jahn, B. and Daumann, L.J., Die faszinierende bioanorganische Chemie der Selten-Erd-Elemente. Chemie in unserer Zeit, 52(3). 150-158. 2018. Hatje, V., Bruland, K.W. and Flegal, A.R., Increases in Anthropogenic Gadolinium Anomalies and Rare Earth Element Concentrations in San Francisco Bay over a 20 Year Record, Environmental Science & Technology, 50(8). 4159-4168. 2016. 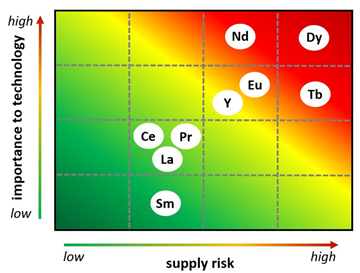 Lorenz, T. and Bertau, M., Recycling of Rare Earth Elements. Physical Sciences Reviews, 2(1). 1-24. 2017. Gauß, R., Diehl, O., Brouwer, E., Buckow, A., Güth, K. and Gutfleisch, O., Verfahren zum Recycling von seltenerdhaltigen Permanentmagneten, Chemie Ingenieur Technik, 87(11). 1477-1485. 2015. National Research Council (Eds. ), Minerals, Critical Minerals, and the U.S. Economy, The National Academies Press. 2008. Marschall, L. and Holdinghausen, H., Seltene Erden. Umkämpfte Rohstoffe des Hightech-Zeitalters, Oekom Verlag, 2017. Schebek, L. and Becker, B.F., Substitution von Rohstoffen – Rahmenbedingungen und Umsetzung, in P. Kausch, M. Bertau, J. Gutzmer and J. Matschullat (Eds. ), Strategische Rohstoffe – Risikovorsorge, Springer, 3-12. 2014. Sawatzki, S., Der Korngrenzendiffusionsprozess in nanokristallinen Nd-Fe-B-Permanentmagneten. Doctoral thesis 2016, http://tuprints.ulb.tu-darmstadt.de/id/eprint/5221 [03.03.2019]. 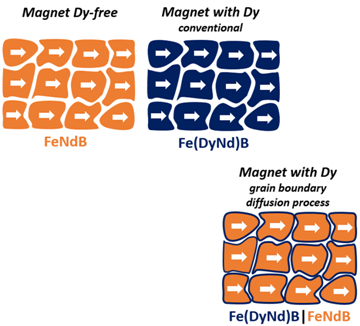 Sawatzki, S., Kübel, C., Ener, S. and Gutfleisch, O., Grain boundary diffusion in nanocrystalline Nd-Fe-B permanent magnets with low-melting eutectics, Acta Materialia, 115. 354-363. August 2016. Reiners, C.S., Kritische Rohstoffe! – Kritische Unterrichtsstoffe? Eine fachdidaktische Reflexion am Beispiel der Seltenen Erden, Naturwissenschaften im Unterricht – Chemie, 28(161). 8-12. 2017. Bliersbach, M. and Reiners, C.S., “Creating Creativity”: Improving Pre-service Teachers’ Conceptions About Creativity in Chemistry, in K. Hahl, K. Juuti, J. Lampiselkä, A. Uitto and J. Lavonen (Eds. ), Cognitive and Affective Aspects in Science Education Research, Springer, 55-68. 2017. Yang, Y., Walton, A., Sheridan, R., Güth, K., Gauß, R., Gutfleisch, O., Buchert, M., Steenari, B.-M., Van Gerven, T., Jones, P.T. and Binnemans, K., REE Recovery from End-of-Life NdFeB Permanent Magnet Scrap: A Critical Review, Journal of Sustainable Metallurgy, 3(3). 122-149. 2017. Bybee, R.W., Toward an Understanding of Scientific Literacy, in W. Gräber and C. Bolte (Eds. ), Scientific literacy – an international symposium, Institut für die Pädagogik der Naturwissenschaften, 37-68. 1997. National Research Council (Eds. ), National Science Education Standards, National Academy Press, 1996. Fontenot, R.S., Hollermann, W.A., Bhat, K.N. and Aggarwal, M.D., Synthesis and characterization of highly triboluminescent doped europium tetrakis compounds, Journal of Luminescence, 132(7). 1812-1818. 2012. Donner, S., Schätze im Schrott. WirtschaftsWoche, 38. 76-79. 2013. Mieger, D. and Prechtl, M., Recycling von Neodym(III)-sulfat aus Festplattenmagneten. Seltenerdelemente im Schülerforschungsprojekt und im Berufsschulunterricht, Naturwissenschaften im Unterricht – Chemie, 28(161). 39-43. 2017. Prechtl, Markus, and Roman Schmidt. "Shaping the future with Rare Earth Elements – Model Experiments for “damage monitoring” with [Eu(DBM)4TEA] and for Recycling of Neodymium(III) Sulfate from Hard Disk Magnets." World Journal of Chemical Education 7.2 (2019): 90-95. Prechtl, M. , & Schmidt, R. (2019). 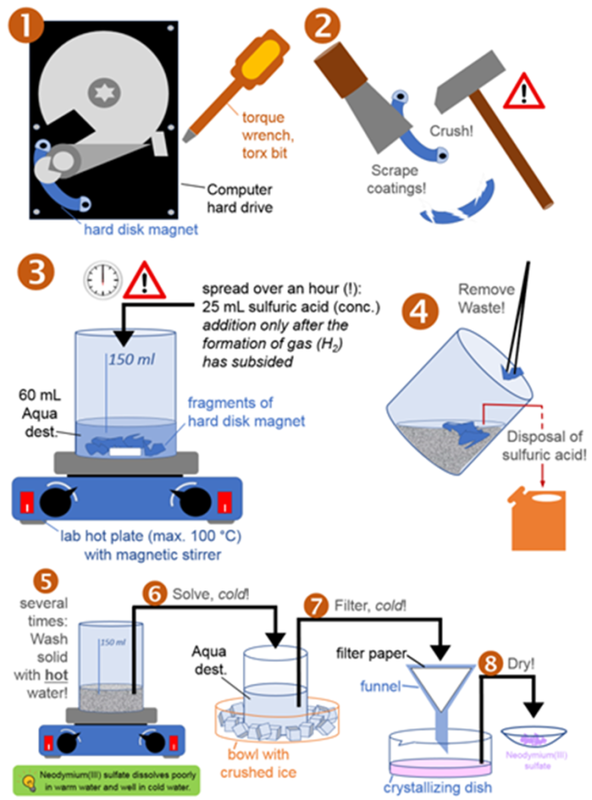 Shaping the future with Rare Earth Elements – Model Experiments for “damage monitoring” with [Eu(DBM)4TEA] and for Recycling of Neodymium(III) Sulfate from Hard Disk Magnets. World Journal of Chemical Education, 7(2), 90-95. Prechtl, Markus, and Roman Schmidt. "Shaping the future with Rare Earth Elements – Model Experiments for “damage monitoring” with [Eu(DBM)4TEA] and for Recycling of Neodymium(III) Sulfate from Hard Disk Magnets." World Journal of Chemical Education 7, no. 2 (2019): 90-95.